Moving to a country is a life-changing experience for many people and the same is true for Moving to Canada from the USA. Here we bring attention to some common concerns. 1 Can I drive in Canada with a license issued by a US state? The Canadian provinces need showing enough driving experience. The process is straightforward and the person can exchange state-issued Driving License for the license issued by a province you intend to move to. There are a few requirements which differ among the provinces. We list the provinces. Prior to exchanging the license, you can drive in Canada on the US license for a specific period determined by the provinces. It is generally 90 -180 days. 2 Will I get a covered in the Public Healthcare System of Canada? Healthcare in Canada comes through a system based on public-funding that is administered by the respective provinces. Having public health insurance, it is not necessary to pay for many healthcare services. A cover by the Canadian Healthcare System depends on your status in Canada, and also the destination province. Visitors to Canada are not covered. In case of international students on a study permit, they may get a cover under the Provincial Plan. Some provinces need international students to take private insurance. The cover of the People moving to Canada from the USA by using the work permit, by the provincial plan is based on the type of work permit. After arriving in Canada as an overseas worker, you need to wait for three months after applying, to get the approval regarding Public Healthcare. Take out a private insurance policy for covering the waiting period. Additionally, the workers in Canada in the International Experience Canada program or in the SWAP Working Holiday program must have a private insurance policy before activating their work permit. Permanent residents in Canada are covered by the Public Health Insurance in their residential province. New PRs must take private medical insurance for the waiting period (three months) before getting the approval regarding Public Health Insurance. 3 Will I have to pay income taxes in Canada and in the USA after moving to Canada? Canada considers an ordinary resident for tax purposes if the person settles in a routine manner in life, and also regularly lives in Canada. Working in Canada, owning or renting property, and having dependents/spouse or a common-law partner, leads to the consideration as the ordinary residents. Staying in Canada for a period of fewer than 183 days in a Tax Year. American citizens considered to be residents in Canada, must pay Canadian taxes, and also file taxes in the USA. All people earning an annual income more than $10,000 US Dollars must file a 1040 IRS Form. Also, there is a Foreign Earned Income Exclusion. The F.E.I.E. permits exclusion of the first $104,000 US Dollars earned from US income tax, by showing residence in Canada for 330 days in a year. Under some conditions, they can get the Foreign Tax Credit so that the income is not taxed twice. 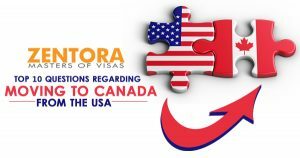 US citizens enjoy visa-free entry in Canada as a visitor, permitting self and family to remain in Canada, for six months. In case there is a plan on moving to Canada from as permanent residents, international students, or foreign workers know which family members, can accompany you. Canada considers family members who accompany as a spouse or as a common-law partner, and children below 22 years. Older children, grandparents, Parents, siblings, uncles, aunts, nieces, nephews and other relatives are not eligible. 5 Can I bring my pets to Canada? Yes, you can, but prepare properly and also ensure that these pets can cross the border to Canada in a stress-free condition. The entry of pets is supervised by the Canadian Food Inspection Agency (CFIA), and please read the CFIA guidelines. Moreover, an import permit, a visual inspection, and a health certificate are compulsory. Have all the relevant documents. Also, bring documents to prove that the pets are rabies-free. The pet must be vaccinated. Canada has a population of 37 million and most of them live in cities and towns that are near the US border. The cities are diverse and also offer many benefits to Americans. Toronto has fine scenery and also a fast-pace. It is the fourth-largest city in North America. Toronto has something for everyone. Vancouver is also a perfect city for you. Montreal allows learning a new language and living in an authentic multicultural city. Halifax, Victoria or Nova Scotia also fit the bill. Calgary has the surroundings of the Rocky Mountains and low taxes. 7 – Getting a job in Canada? Canada is a growing market economy. In order to find a good job in Canada write a perfect Canadian resume and resort to Networking in Canada. There are Employment services and Jobs Board to help in the search. 8 Will moving to Canada from the USA be tough if I have a criminal offense/conviction? Such Individuals could be inadmissible and also require special permission for entering the country. A DUI conviction can also lead to non-admission. Possess a temporary resident permit. 9 Will a child born in Canada be the US or Canadian citizen, or hold dual citizenship? Children that are born in Canada are Canadian citizens right from birth, irrespective of the nationality/immigration status of the parents. Child born on or after June 12, 2017: Child is a US citizen if the mother has lived in the US for at least five years prior to the birth, at least two years of which must have been after the 14th birthday. Canada and the US both recognize dual citizenship, and a child can be a citizen of both these countries since birth. 10 How cold is Canada? The weather in most parts of Canada is cooler in comparison to the United States. Cities in Canada have a climate that is comparable to US cities. There are four seasons. Moreover, summer in some cities has humidity and high temperatures running into the 90s Fahrenheit. The climate of Toronto is similar to Buffalo and Rochester, and Montreal has a climate similar to Minneapolis. Finally, Vancouver and Seattle share moist winters and sunlit summers.